ATAD coordinates exchange opportunities FROM Rochester TO our sister cities. Whether you choose to go for an academic year, a semester, or a summer program, you will gain lifetime memories as a visiting student overseas. What length are the timeframes and dates of ATAD exchanges? Summer programs – six to seven weeks. Semester programs – six months, from January to June. Academic Year Programs – ten months, from August to June. 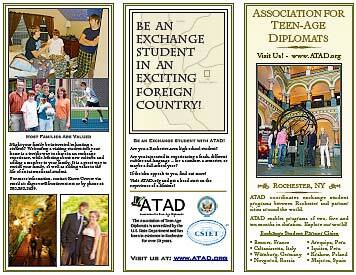 What locations are available for Summer, Semester and Year exchanges through ATAD? Summer programs – Arequipa (Peru), Iquitos (Peru), Caltanissetta (Italy), Majorca (Spain), Novgorod (Russia), Krakow (Poland) and Würzburg (Germany). Semester programs – Arequipa (Peru) , Iquitos (Peru) and Novgorod (Russia). Academic Year Programs – Caltanissetta (Italy), Rennes (France), Würzburg (Germany). What does it cost to be an exchange student with ATAD? Any ATAD program costs $3,100. The largest component of this fee is your round-trip airline fare from Rochester. Financial aid may be available to cover some program cost. Host families provide housing and food. What isn't covered by the ATAD program fee?? • school expenses required by school (transportation, uniforms, books, laboratory fees, etc.) A student will not be placed in a school that requires payment of tuition. • NOTE: If a student is dismissed from any program, voluntarily or involuntarily, ATAD is not responsible for any additional charges, transportation or other fees for a student to return home. What are the language requirements to qualify as an ATAD student? German proficiency for Würzburg (Germany), German language not required to apply, but mustbgain some level of familiarity with German prior to departure. * An interview will be conducted to assess language proficiency. What are the grade requirements to be eligble for an ATAD exchange? Summer programs – minimum of C average (75% or 2.0) for the last four semesters. Semester and Academic Year programs – minimum of B- average (81% or 2.7) for the last four semesters. What are the age requirements to be an ATAD student? Summer programs – between 15 1/2 and 18 1/2 at the time of departure. Semester programs – between 16 and 18 1/2 at the time of departure. Academic Year programs – between 16 and 18 1/2 at the time of departure. What are the grade requirements to be eligible for an ATAD exchange? What grade must I have completed prior to qualify as an ATAD student? Summer programs – between 9th and 12th grade by date of departure. Semester programs – between 10th and 12th grade by date of departure. Academic Year Programs – between 10th and 12th grade by date of departure. How do I apply to be an ATAD student? You can contact us through this website and you can download application forms on our “Forms” page. We look forward to hearing from you!